Effective energy transition is the timely transition towards a more inclusive, sustainable, affordable and secure global energy system. That system provides solutions to global energy‑related challenges while creating value for society, without compromising the balance of the energy triangle. While energy transition is a shared concern among countries, progress will be a function of decisions taken within national settings reflecting specific social, economic and political priorities. The ETI 2019 rankings (Table 1) did not change significantly from last year, especially at the top and bottom of the table. This indicates continued leadership by countries that have performed well historically, an outcome of both technological advances and effective policy‑making and implementation. 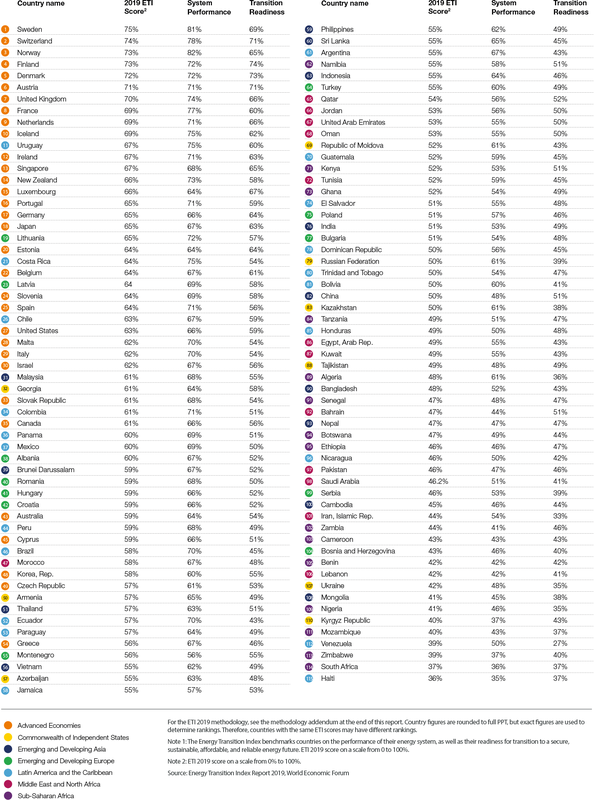 Sweden retains the top spot in the ranking, followed by Switzerland and Norway. All countries ranked in the top 10 are from Western and Northern Europe, and are diverse in their primary energy mix, energy system structure and natural resource endowments. High‑ranking countries also show high scores on transition readiness due to their strong institutional and regulatory frameworks, ability to attract capital and investment at scale, innovative business environment and high‑level of political commitment on energy transition. Countries lagging in the rankings demonstrate the inertia of legacy systems and the need for a strong enabling environment. According to the data, fossil fuel‑exporting countries, such as Nigeria, Mozambique and Venezuela, and countries consuming a disproportionate amount of coal, including South Africa and Mongolia, experience challenges in effective energy transition. Figure 2 shows the global average scores on the dimensions of energy system performance and transition readiness. An analysis of the ETI indicates the pace of energy transition has slowed down. The year‑on‑year increase in the global average aggregate ETI score was the lowest of the last five years,17 suggesting challenges in advancing on energy transition. The following section looks at the progress, or lack thereof, on dimensions of system performance and transition readiness. Energy system performance measures the ability of countries’ current energy architecture to deliver across the three imperatives of the energy triangle: economic development and growth, energy security and access, and environmental sustainability. The insights from the ETI 2019 highlight the persistent challenges in energy system performance. After increasing for four years since 2014, the average system performance score remained flat over the past year; the primary reasons were the continued use of coal for power generation in Asia, increasing commodity prices and the lack of progress on reducing per capita emissions and the carbon intensity of primary energy supply in Advanced Economies. While energy security and access had the highest average score of the three dimensions, environmental sustainability had the lowest average score and improved the least over the last five years (Figure 3). The slow progress on environmental sustainability of the energy system, as suggested by the ETI, is consistent with the latest evidence of the increase in emissions from fuel combustion. For an effective energy transition, countries should pursue a balance between the three imperatives of energy system performance. Achieving this is complex, however, due to the competing priorities in countries, as well as economic and geopolitical uncertainties. Though they sustain higher than average scores on individual dimensions, economies with high scores on energy system performance tend to overprioritize improvements along select dimensions instead of targeting a balanced approach (Table 2). This might be a consequence of the energy system’s structure and suggests that energy transition is a complex process. Even leading countries have yet to determine a comprehensive roadmap for a secure, sustainable, inclusive and affordable future energy system. This dimension measures the extent to which energy contributes towards economic development and growth in a country in terms of affordability of energy services to households, cost‑competitive supply of energy to industries and impact on gross domestic product (GDP) through exports, imports or energy subsidies.18 The distribution of scores on economic development and growth is the narrowest among the three dimensions (Figure 3), implying that countries exhibit relatively less difference on this dimension. This indicates the importance of country‑specific circumstances in energy policy‑making, such as the structure of the economy, the stages of development, and social and political priorities. Countries that rely heavily on revenues from fuel exports score highly on affordability of energy services and on energy security and access. However, their ranking in the bottom quartile of the transition readiness component signals challenges in creating an enabling environment for energy transition. While increasing export revenue from fuels indicates the energy sector’s positive contribution to a country’s economic development and growth, it also highlights the need for structural reforms to protect against shocks from energy transition, such as electrification and the mainstreaming of decentralized renewable energy sources. Cheaper renewable energy and efficiency gains from digitalization offer competitive advantage on manufacturing that can stimulate economic growth and generate new sources of employment. Additionally, the fuel import bill as a percentage of GDP increased in almost all fuel‑importing countries in 2017, largely due to an increase in commodity prices. However, and primarily in emerging economies, the increasing fuel import bill is also the result of rising demand across all end‑use sectors. Energy services generally become less affordable in such a scenario or affect economic growth indirectly through higher fuel subsidies. This dimension measures the sustainability of the energy system in a country by considering the energy intensity of GDP, the system’s emission intensity and the level of pollutants. Producing an accurate measurement of the environmental footprint across the energy value chain is challenging due to the lack of data on the effect of emissions on public health and the implications of the energy system on land and water use, among others. Scores on this dimension have been consistently low, with no significant signs of improvement. This is alarming considering the availability of low‑carbon technology alternatives and the amount invested in low‑carbon energy sources over the past five years. It demonstrates the persistent nature of the environmental sustainability challenge, as well as the strong path dependency of economic growth on energy consumption. Urgent and accelerated measures are required to have a noticeable effect on environmental sustainability. Beyond enabling policies and investments in alternative power generation and electrification of transport, deep decarbonization strategies of economic sectors with higher abatement costs than other sectors, such as aviation, shipping and heavy industries including steel and cement production, need to be pursued through energy efficiency and demand management.22 Employing Fourth Industrial Revolution technologies that offer pathways to enhance productivity and efficiency is important for faster progress on environmental sustainability. Negative emissions options, such as carbon capture and sequestration and natural carbon sinks, must be prioritized to buy more time. Moreover, given the scale of the challenge and the urgency of expedited action, a common understanding among policy‑makers and the private sector is required on the priorities and pathways for environmental sustainability. On average, countries have improved on energy security indicators, determined by countries’ ability to ensure “uninterrupted availability of energy sources at affordable prices”.23 More than half of the economies improved the diversity of both their fuel supply sources and their import counterparts. Reducing concentration in the fuel supply mix and import partners is critical to hedging against fuel price volatility and geopolitical shifts. High‑ranking countries that depend on imports have approached energy security through diversification, as well as through demand‑side strategies to enhance self‑sufficiency. This is relevant for emerging economies, especially those in Asia, which are importing more fuel to meet the rising demand for energy. Ensuring reliable and secure access to modern energy services is a key objective of energy transition. Countries have made strong improvements in energy access, as demonstrated by increasing levels of access to electricity and improving the quality of its supply. Between 2014 and 2016, more than 400 million people have gained access to electricity, reducing the total number of people globally who lack access to electricity to under 1 billion for the first time ever.24 Since 2000, the number of countries with universal access to electricity increased from 70 to 118.25 The gains in electrification are due to large‑scale programmes in South and South‑East Asian countries, where a mix of grid expansion and decentralized generation sources were used to increased access to electricity. The progress in Sub‑Saharan Africa, where more than 600 million people lack access to electricity, remains slow.26 To realize the Sustainable Development Goal (SDG) of universal access by 2030, the rate of electrification needs to increase. In fact, the percentage of the global population lacking access to electricity and clean cooking fuels has declined over time (Figure 4). The ETI captures the readiness of a country through six enabling dimensions: energy system structure, regulation and political commitment, capital and investment, human capital and consumer participation, infrastructure and innovative business environment, and institutions and governance. The 10 top‑ranked countries for transition readiness can be shown with their scores for each of the six dimensions (Table 3). The existing energy system structure’s effect on readiness is measured through the country’s current level of energy consumption per capita, the share of power generation from coal, and the share of generation from renewables and carbon content within the country’s fossil fuel reserves. This dimension is important for transition readiness because the existing energy infrastructure or resource endowment could affect the decision‑making processes and political priorities for some countries. Developing transition policies within fossil fuel‑rich countries would demand stronger political will and may require lengthier stakeholder engagement. High consumption per capita indicates a certain level of energy affluency among consumers and will vary depending on the structure of the economy in other cases. This year’s analysis shows that the 10 countries with the highest scores in readiness all score low in energy system structure. This applies to most of the countries within the larger group of Advanced Economies. In many cases, this was due either to the high energy consumption per capita resulting from the high level of income and development in these countries or to the share of coal in their energy systems. While per‑capita demand for energy is relatively high for many Advanced Economies, reduction is anticipated over time given these countries are strongly committed to energy efficiency. This is captured in the regulation and political commitment dimension of the Index, with Advanced Economies scoring 75% on average in the World Bank Regulatory Indicators for Sustainable Energy (RISE) efficiency indicators compared to an average of 50% for the countries analysed in the Index. 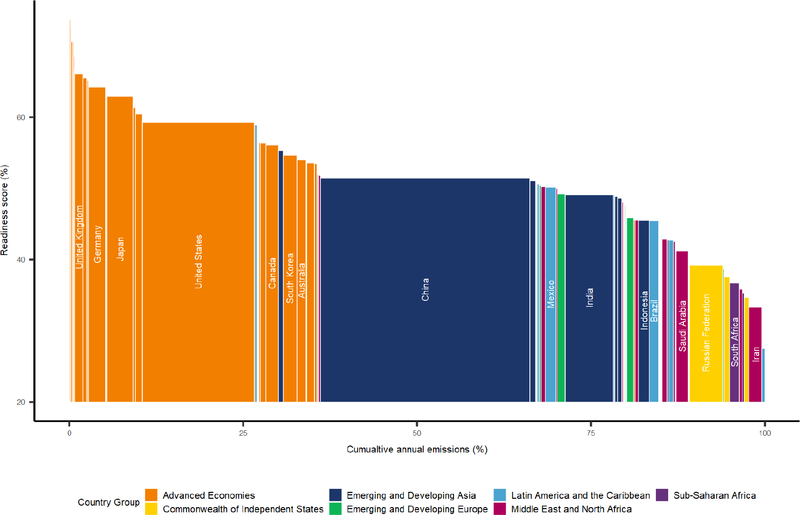 This dimension measures countries’ dedication to the energy transition through their commitment to nationally determined contributions to emissions reduction and through their policy stability as indicated in the World Economic Forum Global Competitiveness Report, as well as through World Bank RISE scores for energy efficiency, renewables and energy access. Improvement in energy efficiency and renewables policies have been driving the improvement across this dimension; Italy, Canada and South Korea were the top three countries in energy efficiency policies in 2017, while Germany, India and the United Kingdom were the top performers in renewables policies. As expected, the data shows positive correlation between regulatory indicators and the infrastructure and innovative business environment. This dimension is measured through the innovative business environment index, the availability of technology index, and the quality of logistics and transportation infrastructure indices. The availability of technologies encourages the development of ambitious energy programmes. At the same time, energy policies provide certainty and opportunities for businesses to innovate. Out of the top 30 countries in innovative business environment, 24 are also among the top 30 in regulatory and business environment. The institutions and governance dimension attempts to measure the perception of credibility in countries’ institutions, an important factor in building investor confidence and mobilizing financing for the energy transition. This composite index builds on indices for the rule of law, perception of corruption and a country’s credit rating. The data show positive correlation between this dimension and the one for regulation and political commitment. The IEA estimates the average annual investment required to meet the Intergovernmental Panel on Climate Change’s 2°C scenario at $3.7 trillion between 2016 and 2050.28 Many sources of finance will need to be mobilized for the sustainable energy sector, and policy‑makers must be open to new and innovative forms of financing and business models for energy firms. This dimension considers a country’s investment freedom, access to credit and change in annual renewable capacity built, as well as the proportion of energy investments directed toward energy efficiency, as a measure of its ability to attract capital and investment. Investment freedom is critical in mobilizing financing for the energy transition. The data from 2018 show that the top 10 countries in readiness consistently scored high in this indicator. A bidirectional relationship exists between the energy transition and society. The transition can create shared growth through increased job opportunities. The magnitude and impact depend on the energy system’s current state and whether jobs could be lost during the transition. Moreover, as energy systems change, human capital development will need to be prioritized to foster know-how for the management and operation of the future energy system. The analysis for 2018 shows a high level of readiness is concentrated among nations that have a comparatively lower impact on the pace of the global energy transition. In some cases, this is merely due to the size of a country’s energy system; in others, the country has already evolved to where incremental benefits are less impactful on a global scale. The latter argument is supported by a trend analysis of the readiness score, which indicates that Advanced Economies have had the least improvement over the past five years given their mature ecosystems for the energy transition. The focus on emissions demonstrates the concern, while understanding that the ETI measures the transition beyond emissions to cover environmental sustainability, economic development and growth, and energy security and access. While countries with evolved energy systems may have only a small impact from changes within their systems, those countries could have great potential in advancing the transition in less developed economies. Countries with evolved systems experimented greatly and learned lessons that resulted in their current systems. For example, the evolution of energy markets in California (USA), the success of green energy transition in Germany and the sophisticated integrated energy planning processes in Japan offer many lessons for developing nations. 17 The Energy Transition Index was launched in 2018. For previous years, ETI scores for countries were calculated using historical indicator data from indicator sources, to the extent available. 18 Due to the unavailability of revised data on energy subsidies (as a percentage of GDP) from the International Monetary Fund at the time of publication, energy subsidy statistics with respect to countries from 2015 were used in the ETI 2019. 19 Lavrijssen, S. and Parra, A.C. “Radical Prosumer Innovations in the Electricity Sector and the Impact on Prosumer Regulation”, Sustainability, Vol. 9, 10 July 2017. 20 IEA. CO2 emissions from fuel combustion, 2018 edition. 21 IEA. “Carbon emissions from advanced economies set to rise in 2018 for first time in five years, reversing a declining trend”, 4 December 2018, https://www.iea.org/newsroom/news/2018/december/carbon-emissions-from-advanced-economies-set-to-rise-in-2018-for-first-time-in-fi.html. 22 Energy Transitions Commission. Mission Possible: Reaching Net-Zero Carbon Emissions from Harder-to-Abate Sectors by Mid-Century, November 2018. 23 IEA. “What is energy security?”, 2019, https://www.iea.org/topics/energysecurity/whatisenergysecurity/. 24 International Bank for Reconstruction and Development/The World Bank, Tracking SDG7: The Energy Progress Report 2018, Chapter 2, 2018, http://trackingsdg7.esmap.org/data/files/download-documents/chapter_2_electrification.pdf. 25 Calculation made from World Bank World Development Indicators, https://data.worldbank.org/indicator/eg.elc.accs.zs. 26 Calculation made from World Bank World Development Indicators, https://data.worldbank.org/indicator/eg.elc.accs.zs. 27 According to the African Development Bank, “women and girls bear the main burden of biomass collection.” From Empowering Women in Africa through Access to Sustainable Energy: A desk review of gender-focused approaches in the renewable energy sector, African Development Bank, 2016. 28 OECD/IEA and International Renewable Energy Agency. Perspectives for the Energy Transition: Investment Needs for a Low-Carbon Energy System, 2017, https://www.iea.org/publications/insights/insightpublications/PerspectivesfortheEnergyTransition.pdf.